The introduction of the Drawmer DL241 Dual Channel 'Auto-Compressor' highlights the beginning of a new generation of dynamic processors which set new standards of sonic excellence. Its combination of features, displays and well designed control functions make it an outstanding product for a vast range of broadcast, sound reinforcement, and recording applications. The DL241 'Auto-Compressor' incorporates many automatic functions allowing the engineer to achieve optimum results in the minimum set up time but does not compromise skilled users with limited controls. Its sophisticated design produces a smooth, transparent and warm sonic performance. 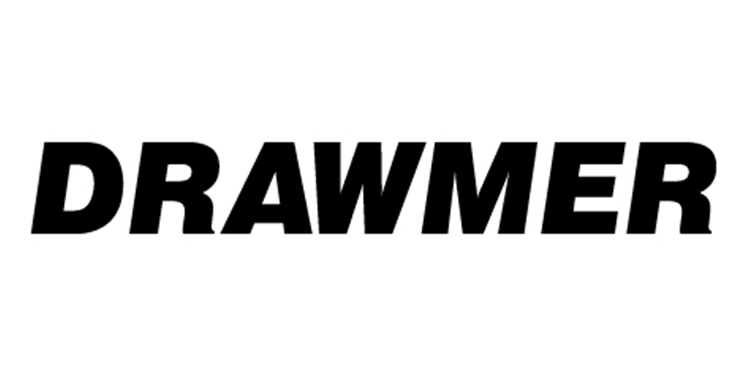 Expander/Gate : Drawmer's unique "Programmed Adaptive Expansion" circuitry allows effective 'single control operation' producing a fast smooth response and eliminating 'chatter' on or around threshold. This design differs from that of conventional Expanders in that the Expansion Ratio, Hold Attack and Release continually adapt themselves to the dynamics of the incoming signal. 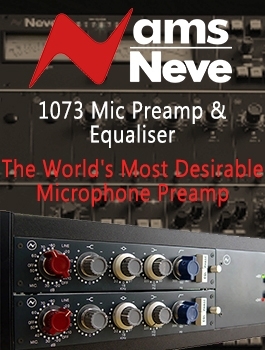 The Expander/Gate provides 80dB range and variable threshold from +20dB to 70dB with an OFF position. Switching is provided for 'Fast' or 'Slow' release characteristics. The 'Fast' mode can be used for instruments with rapid decay times or for additional tightening of the gating effect. The 'Slow' mode is more suitable for vocals and instruments with longer decay times or can be used to smooth over rough fade outs. A single LED indicates gating action. Compressor : A full Auto Attack/Release Compressor with variable Threshold and Ratio successfully combines the smoothness of the 'Soft Knee' principle with the precision of a 'Ratio' control. 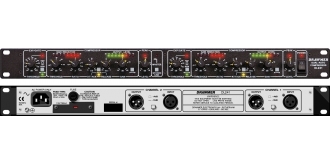 The advantage of this combination is that instead of the onset of compression being sudden at the threshold point the ratio increases over a 10dB input level range until it reaches the ratio set on the front panel control, thus achieving a more natural sounding compression. Selectable manual or fully automatic Attack and Release times dramatically extend the application range and user scope of the DL241. Selecting the 'Auto' mode removes the need for manual adjustment and is particularly valuable when the program being treated does not have predictable or consistent dynamics, often the case when processing a complete mix or a virtuoso bass guitar performance. Under manual control the wide range of adjustment available gives the user the ability to create dynamic effects as well as normal compression. Peak Level. 'Zero Response Time', 'Zero Overshoot' circuitry : This provides an absolute limit to the peak level of the output signal, adjustable from OdB to +16dB above system level. When set to the required level, any excessive peaks will be stopped and the gain momentarily decreased if necessary. The 'Zero Response Time' is essential to avoid unpleasant distortion when mastering for CD or sending any signal to digital equipment. 'Zero Response Time' means that the DL241 provides complete protection from even the fastest and shortest signal 'spikes' (overloads), making the unit also ideally suited for speaker system protection in sound reinforcement applications. Metering : Comprehensive bar graph displays give 'at a glance' indications of gain reduction, and output signal level Gain reduction from 1dB to -30dB is shown simultaneously with signal level from -20dB to +15dB Other single LEDs indicate function status of Gating Acton, Auto Mode, Bypass, Peak Limiting, Stereo Linking, and Power On. Stereo Link : When processing stereo signals, linking should be used to prevent image shifting. This facility ties both channels together. Using channel 1 (left) as the master channel removes the need to duplicate control settings for both channels. Bypass : A fully balanced hard-wire bypass connects the input directly to the output allowing signal to pass through the unit with no power applied. In bypass the VU level meter displays the Input signal. Operating Level : The operating level of the DL241 can be instantly switched, independently on each channel, for either +4dBu or -10dBu operation using a rear panel push switch. 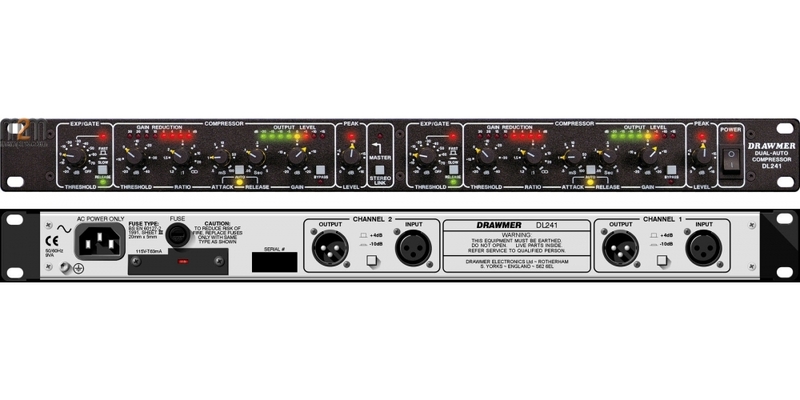 Input/Output : The DL241 is available with either XLR connections and fully balanced inputs and outputs, or with stereo jack (TRS) connections, fully balanced inputs and single ended outputs.